In previous lessons, we have gone over how to start to construct figures for poses viewed from the front. Our process is similar for poses viewed directly from the side and from the back, with some small modifications. Here’s the approach we can use when we are side-on to the pose such that we can only see one shoulder or we cannot see both tips of the pelvic bone. The approach starts the same way – with the same approach to the head. Just put in the dissecting lines that you actually see on the head. 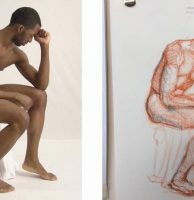 Since we are viewing the pose from the side, instead of the centre line of the front of the torso, we’ll put down the outline that we can see created by the back, going from the head all the way down to the buttocks. Most of that line is going to be dependent on the spine. We’ll talk a bit more about the characteristics of the spine’s curvature in a future lesson. For now, aim to capture the line of the back that you are seeing, noticing the angles and any changes in its curvature. We’ll then add our side view of the ribcage. 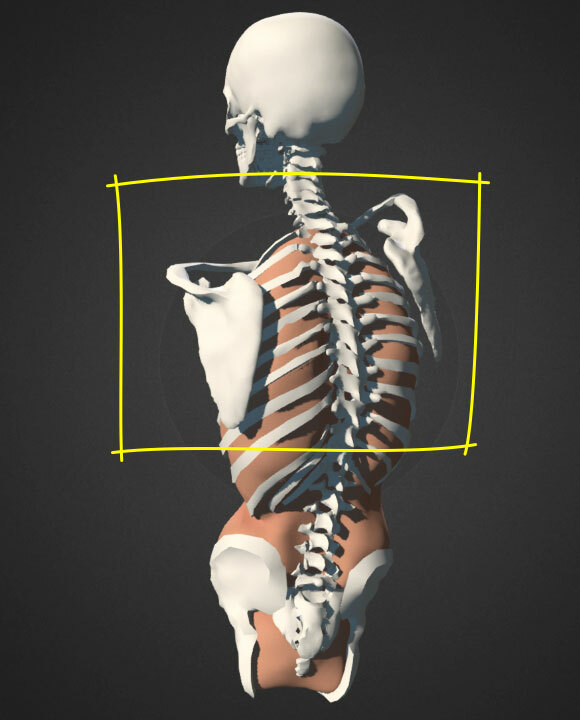 You should already be familiar with this shape from our 100 ribcages exercise. Usually the ribcage does provide some visual landmarks in the side view, as we can often see the curvature of the ribs under the skin. Having an idea of where the solar plexus is will help. Don’t mix up the ribs with the muscles on the side of the torso though – they can look like ribs too! If you can see it, it would be good to mark in a line for the shoulder blade, also known as the scapula, which is generally a visible landmark. The shoulder blade is a triangular bone that sits on the upper back of the ribcage, and attaches to the shoulder. You can see these on a lot of poses viewed from the side or back, especially on a skinny figure. They move around depending how the shoulders and arms are held. Their top edges point up at the shoulders. If you aren’t sure what you’re looking at, and not comfortable with it, just leave them for now. We’ll look at these in more detail in a future lesson. If you can’t see the scapula, you can instead add a shape to show where the shoulder is. We won’t try to put in a line between the shoulders since we generally can only see one. Instead, we can use an oval for mass of the shoulder we can see. We aren’t trying to accurately represent the deltoid muscle here – just roughly get down its position and direction. To place it, check where it is in relation to the line of the back we put down. Next we are going to add the same imagined waistband line that we learned about earlier in the lesson. We should make sure we’ve got the curvature of the buttocks right too. If we can see the triangle going down to the crotch we can add it. We can now add the simple lines to show the direction and length of the arms and legs, as we did before. For poses viewed from the back, again we can start with the head. We can still add our dissecting lines to indicate where the head is pointing. We might not be seeing the chin this time, which before was the basis for our curving lines down the head. If we are looking at the back of the head, we can draw the ball of the dome of the skull. If there is a lot of hair such that you can’t really see the skull, you’ll have to try to imagine where it is – that way we can build up the shape of the hair on top of it. Don’t worry too much about getting it wrong though. We are going to draw the curves of the spine next, and keep that curve going all the way down the crack between the buttocks. The curves of the actual spine may get obscured sometimes by muscles – just draw the curve you can see for now. We’ll add the ribcage next. The shape of the ribcage is sometimes a little harder to see from the back, depending on how covered up it is by muscles and fat. 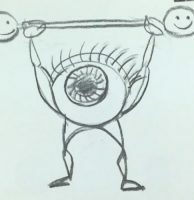 Draw it in if you can – remember we are trying to draw things that are going to help us, not stress us out! We know where it’s top will be, and we know from the spine the angle it’s running along, so we should have enough information to get something rough in. Next we’ll place the shoulders. If they’re easy to see, we can again try drawing in little triangles for the shoulder blades. If you prefer, you can just draw a straight line between the centres of the mass of each shoulder. What we want to get right is the overall angle between them. We will add our imagined waistband line. Finally we’ll do our simple lines to show the direction and rough lengths of the arms and legs. If you have an arm or leg that’s hidden, it’s still useful to lightly add where you think the lines are for it. Having a sense of the whole pose is going to help you understand the bits you can see better. Some poses are partly viewed from the side and partly from the front or back, since the figure is twisting. In these cases, put in parts of the construction based on whatever you can see. If you can see both shoulders, then you can put in the shoulder line. If you can see the spine, put that in. If you can see the centre line of the torso, then use that. There’s no hard rules to all this, these are just lines designed to help you out. These lines work for you, not the other way round! The exercise for the side and back views is again really simple – draw these constructions for poses viewed from the side and back. We would suggest aiming for about 5 minutes per pose, getting 12 done for an hour’s practice, but don’t worry if your pace is different to that. Ok, we’ve got our foundations for the drawing in place. This might take you ages at first. You might make a mess. You might not be able to keep it light, because you have to go over it so many times! That’s absolutely fine. You can take your time for now. The speed and fluidity will come once your eyes and hands are more trained up. You’re doing great – be sure to practise and stay positive! Once you’ve done the exercises and you feel ready, move on to the next lesson where we will take another big step and start to block in the full figure. If you are enjoying these lessons, please subscribe to our newsletter below – we will send some tips and inspiring drawings every few weeks via email. Also, we have started to use YouTube, so please subscribe to our channel there. Thanks enjoying learning and I think it is working! Thanks Jo! The number one thing above all else is consistent practice, and that is a lot easier when you are enjoying it. So even if you finish these lessons, have fun drawing everyday! I like the calm commentary and the voice comes over well. I like the sense of there being different approaches and this being acknowledged along the way. 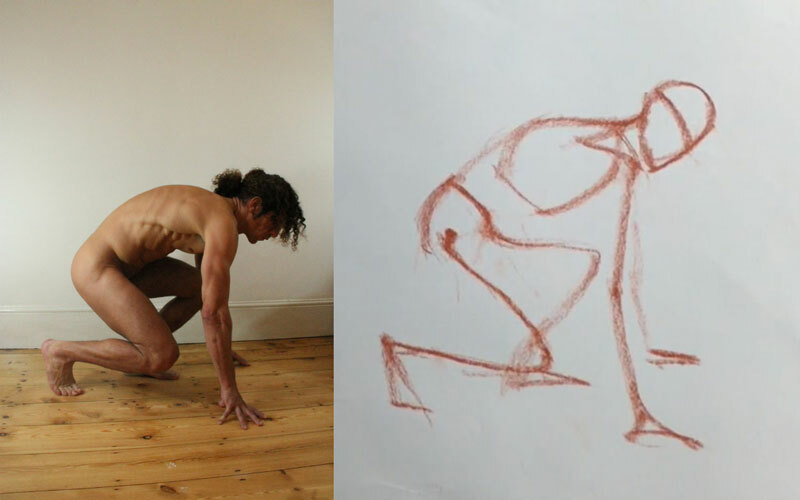 I do find the degree to which ribcage and pelvis and so on need imagining under muscle and fat quite difficult but I can see that combined with the stickman approach they will help build a convincing representation of a pose. I love the idea that hand and eye need to work almost independently of brain and language to find a way and that brain should trust rather than question all the time what is going down on paper. That said, you use language well to complement demonstration. Thank you for so thought-provoking a free resource. I must wonder why you are doing this and I have registered a few possible reasons, all of which I think you refer to: the compulsion to draw; the aim of drawing beautifully or of rendering the appearance of physical beauty in a human being in the form of a beautiful drawing – that sounds rather longwinded; the recognition that aspects of the task might throw up challenges such as proportion and accurate alignment of limbs so that some encouragement and practical help will be a benefit perhaps worth sharing; the recognition that the artistic temperament may be subject to self-questioning, self-criticism and self-doubt or at any rate lows and need lifting up again to address the task not only with new vigour but also a more constructive approach involving the gradual building-up of a suitable self-discipline without being too hard on yourself and an appropriate and really dependable method. 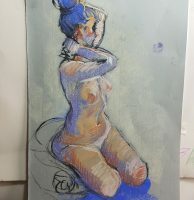 Maybe the ‘stickman’ approach is one such because it takes you to the inner core of the pose – arcing movement and tension may make it seem more like this core is constructed from wire – and for the moment ignores the surface and colour, if not the texture, of the flesh.